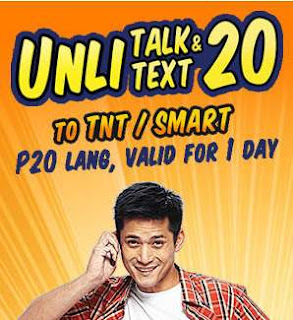 Mga ka-tropa, here is the newest and latest, pinakasulit na UNLI-Combo mula sa Talk N Text, UNLI TALK&TEXT 20. For as low as P20, you can now enjoy unlimited texts and unlimited calls to all your friends in TNT and SMART for 1 whole day. Panalo sa presyo, ang UNLIMITED COMBO! This promo is available to all Talk N Text Subscribers nationwide. Pde po mag EDAY when using this promo? how to used the unli call? do i need to dial a special #, like *143? Pwede po ba kapa extend?